One of my columns titled, Westside Story – Hey You, Get Off The Sidewalk appeared on a Friday, March 28, 2019. A writer never knows what kind of public reaction will follow a freshly written column. My column, having to do with the impact of the No Pedestrian / No Walking signs, related to the recent improvements on Gravelly Lake Drive. The article generated a lot of shared thoughts and opinions. I expect the commenters did not realize I was in agreement with most of their views. My main message, based on the information I had, was that it did not seem appropriate to criticize, condemn, or complain about our Lakewood City Council or our Lakewood City staff in connection with this particular project. Setting that discussion to the side, I would like to focus on another concept as it relates to the Gravelly Lake Drive SW roadway improvements. Great modern street improvement with wide sidewalk designed to accommodate walkers, wheelchairs, baby strollers, joggers and bicycle riders. I have been a resident of Lakewood for 50 years which is long enough to have learned that at one time ago, there was only a single traffic light on Gravelly Lake Drive. The street was a two-way roadway with a single lane in each direction. Down through the decades, our local leaders have generated a long series of improvements as Lakewood grew and Gravelly Lake Drive needed to be improved. Lakewood City Council and Lakewood City staff are responsible for the new set of improvements which is beginning to make the roadway an asset in our community. Regardless of the source of the money to pay for the improvements our community benefits from the advances in several ways. For many years certain areas surrounding Gravelly Lake were hazardous for walkers, joggers, bicycle riders and baby strollers. The improvements help either mitigate or eliminate public danger. The upgrades help set up our city to save lives. The city’s effort to circumnavigate Gravelly Lake with a user-friendly sidewalk system encourages exercise which enhances health and fights the obesity epidemic afflicting America. The professional sidewalk system adds class to our city making it a more desirable, safer, more pleasant, and user-friendly place to live. Sure it would be cheaper to just leave the Kill Zone conditions in place along with the old original dirt road, but the improvements down through the years make our city a more desirable place to live and raise a family. Lastly, I wish to repeat that the improvement plans were supported by a financial grant program. Sure that means the improvements were tax-payer funded, but if Lakewood leadership had not made an active effort to share in the available taxpayer funds by applying for the grant, the taxpayer funds would have gone somewhere else. Thank you Lakewood City Council and Lakewood City Staff. It often appears members of the Lakewood City Council are essentially volunteering for a thankless job in their effort to serve our community. While we may not agree all the time with all the decisions and all the actions of our Lakewood City Council, let’s be fair and appreciate their accomplishments for our city. 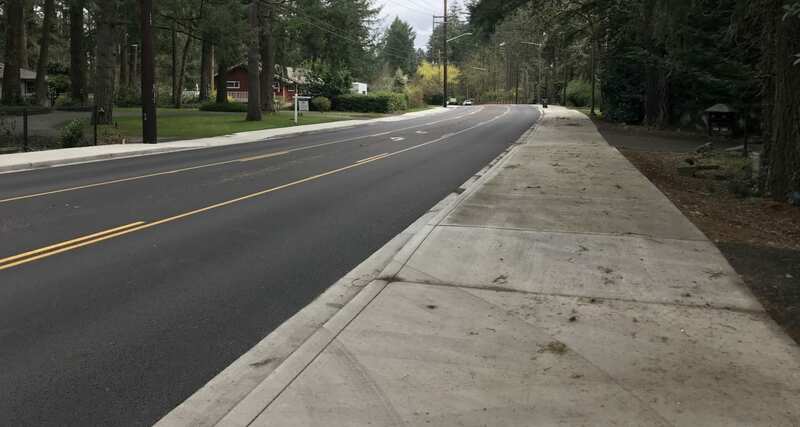 Implementing the Gravelly Lake Drive SW roadway improvements by leveraging grant money along with a small amount of Lakewood money was a genius move. The only way to get us out of our cars is to have safe walking and biking paths and improve public transit. Safe. Accessible. I lived at Country Place off Lakewood Drive and worked within a four block radius but couldn’t get to work then without a car. No safe way to walk the four blocks. That treacherous area has now been turned into a walkable area by the City of Lakewood. I see more of the students walking to school. (Before the parents drove them and dropped them off.) Kudos for the forward thinking improvements. I agree the oversize sidewalks on Gravelly Lake Drive are a welcome improvement. The signs prohibiting pedestrian crossings are another issue. The restricted crossing area is approximately one mile from Washington Blvd. to Nyanza Rd. In this one mile section of Gravelly Lake Drive are two bus stops. Since the bus leaves in one direction and returns in the opposite, riders are forced to either jaywalk (in an area where jaywalking is prohibited by signage), or walk up to a half mile to legally cross the street. There are of course other reasons pedestrians may want to cross the street and I would urge the city to reconsider a few well placed marked crosswalks. Improving traffic flow is a worthy goal, but some balance should be made for pedestrians. And let us hope that maybe the pot holes on Nyanza Road SW will be filled this summer. Please and thank you. Do we know if sidewalks will be installed around the entire Gravelly Lake Loop including Nyanza connecting all the way back around to Washington Boulevard? Eventually. But it will require grant funding, just as the recently completed section did. With my ear to the ground, the rumor I heard was, YES! The plan is to circumnavigate the entire lake including Nyanza. Our Lakewood City Council, not wanting to drain our city resident pocket books with bigger tax bills, intelligently worked on these improvements using the financial grant approach. The grant they captured was enough to complete the improvement that are now in place. Future grants will help complete the safety and city enhancement task. If anyone with the city reads Mr. Dobson’s question and my response, please jump in to provide us with the hard facts. This grant method is fantastic! I would like to offer up Lake Louise Drive as a candidate. We are what could be considered “off the beaten path”, but with 5 schools within walking distance of this circular road, we have an awful lot of foot traffic by students attending either Lakes HS, Pierce College, Mann Middle School, Lake Louise Elementary and Lakewood Lutheran School. There is NO sidewalk on ANY part of Lake Louise Drive NOR is there one on 101st Street, SW, which leads down to Lake Louise Drive from Farwest Drive (i.e., the path to Lakes HS and Pierce College). Besides their walking to and from school we have students practicing for track/cross country that use 101st and the first part of Lake Louise Drive as their main route to get to Steilacoom Park – over a very steep grade. Unfortunately there is no off-pavement passageway for them to do this, so they have to run as far-right as they can to get down the hill. For the most part, the only “safe” walking-course around Lake Louise Drive (for those unfamiliar with this street, it is circular ) is to walk the inner part of the circle. Even so, there are two places where one has to switch to the other side because no really safe path exists at all for those points (the steep curves on the NE end of the drive. Besides the students there are many, many people that walk around the lake using Lake Louise Drive on a daily basis, even in less-than-desirable weather. That includes several older people who walk this road nearly every day. Necessarily, these citizens must also be very, very careful when they do this because of the traffic volume and, generally, with too many drivers going well over the 25 MPH speed limit. NOTE: A City of Lakewood 2017 Speed Tube Study had results showing there was an Average Daily Total of 841 vehicles over an 8-day test period on just the 101st Street, Lake Louise segment of this northern-most part of the roadway around Lake Louise. So, with all of these facts in mind, Lake Louise Drive is, I believe, a warranted candidate for one of those grants. I would most assuredly be willing to take part in developing such a grant – all I need is a point-of-contact to get this thing started (my Phone is 253-582-3732).